In his best shape, Marco Haas aka T.RAUMSCHMIERE introduces the second 12" chapter of his upcoming album "I TANK U" (strike 96, sept. 2008) by releasing "ANIMAL TERRITORY/BRENNER"! After his grande techno instrumental EP „E" (strike 92) this 12" features the PUPPETMASTAZ and DEICHKIND w/ THE CRACK WHORE SOCIETY as debuting guest vocalists for the man behind monster wheels. No co-op could surprise more - or fit better. as classical defjam link between BEASTIE BOYS and RUN DMC. "BRENNER" fits perfectly as another killer track from "I TANK U" and takes another deep step into the rap history of tomorrow. 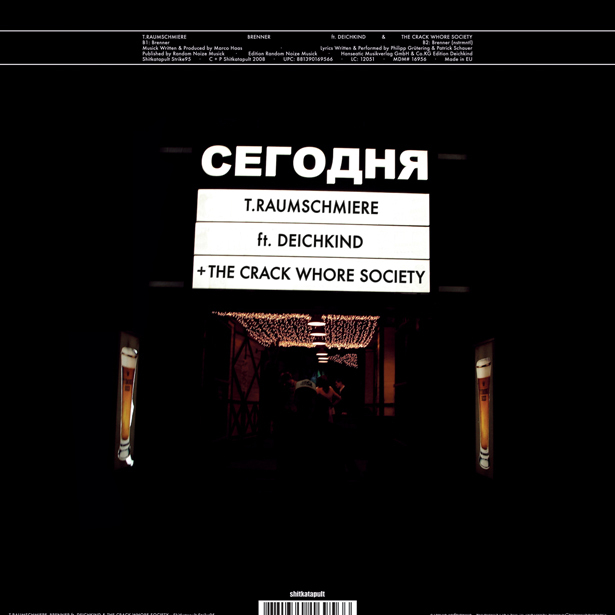 The clear techno beat involves a yet known great way of synthsounding music progression by the unlimited berlin producer and backs up german rap kings DEICHKIND together with Marco Haas´ punkrock band THE CRACK WHORE SOCIETY. "BRENNER" (engl. burner) tells a story of a burnout party feeling with no return. A deeper understanding of T.RAUMSCHMIERE´s mu-sick-al life, something wonderful and dangerous: feeling alive. Both sides are completed with instrumentals - for djs, listeners and musick lovers. And you can get a good taste of the musical progression of T.RAUMSCHMIERE´s upcoming studio album "I TANK U" on SHITKATAPULT. You can „feel“ the mean beats, distorted waves and a great deal of live drum sounds (played by his live band drummer BEN LAUBER), all mixed perfectly analog by MOSES SCHNEIDER (beatsteaks, tocotronic, etc.pp. ).